At the fag-end of autumn, when most of the leaves have fallen and few town trees look exciting, the sultry glow of this one stands out. The leaves remain on the tree very late, some of them tinged with dark red, and the luscious-looking fruit, which for some mysterious reason rarely interests birds, lasts through the winter. Crataegus x lavallei (Hybrid Cockspur Thorn) is a hybrid between two North American hawthorns, C. crus-galli and C. stipulacea; it was first raised in Segrez Arboretum (Seine-et-Oise), described 1880. If I remember to take a look next May, I'll know if this tree is the type (yellow anthers) or var. 'Carrierei' (pink anthers). I accidentally tore the petiole off this leaf (grabbed while running past). Also, the base is generally cuneate, not rounded. I've pretty well finished updating Euripides for the Brief Hist - basically a list of all the known plays, with some sparse reflections. This has been my delight over the past year, though it's hard to explain why. I don't know a word of ancient Greek - I can barely decipher the alphabet. One of the translators wrote: "The highest ideal of a translation from Greek is achieved when the reader flings it impatiently into the fire, and begins patiently to learn the language for himself." (This was in 1956, when the reader had an open fire and was tranquilly deemed to be masculine.) That isn't how it worked out in my case - the very availability of so many translations meant that learning classical Greek seemed quite a low priority compared with learning a few modern languages to the various levels of incompetence that I've managed to attain. Also, recent articles on Intercapillary Space: Elizabeth Willis and John Gay. Very soon forthcoming: Catherine Daly, again. I have future plans for pieces on Hjalmar Söderberg (Doktor Glas, of course), rob mclennan, Aase Berg, Pentti Saarikoski & Gunnar Björling. But if I'm off to Spain I might just translate some more Bécquer... - coincidentally there´s a translation of the whole of the Rimas just published by Shearsman, but I won´t look at this yet; it would spoil my fun. of anyone? No - oh . . .
just floated up & over . wrath of the waves while L.
& get absorbed in a book? Zutaten: Roggenvollkornschrot (59%), Wasser, Salz. Ingredientes: harina integral de centeno, aqual, sal. Very nice despite minimal ingredients -- 8/10. antioxidante E-300, sal y levadura. texture, but sweetness a bit cloying. everything but a finished & profitable line. wintry clothes at a bootsale in July." bottle in about 5 secs using hardly any water. I had been filling it up pointlessly to no effect. edness. Such Slow, laborious, wrong ness." So I've belatedly bought a digital camera... it's only a budget one, and I won't name and shame it, since I have no ambition of taking overwhelming pictures like the ones you can see nearly every day on Such Stuff. 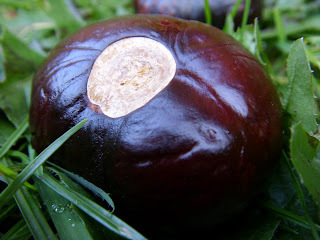 These are the conkers (botanically, seeds) of Aesculus Indica, the Indian Horse Chestnut - wrinkled, blackish-brown and with a small eye. 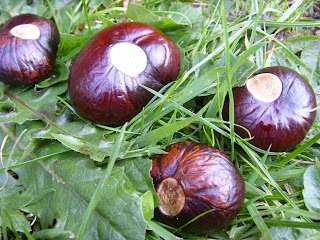 Conkers would be jewels if they could be kept shiny, but they lose their beauty in arid rooms, and these were already a little spoiled when I thought to leave them discreetly on the nearest verge overnight, hoping my camera would show up in the morning. I did know that the rules for zoological nomenclature were different from the rules for botanical nomenclature. For example, an animal can have the same specific name as its generic name, e.g. Chloris chloris, the greenfinch. In botanical nomenclature this is called a tautonym and is outlawed. So far, this evidence of the historic inability of the zoological and botanical communities to act in concert did not seem all that significant. What I hadn't grasped before was that they have independently used many of the same generic names: thus Oenanthe oenanthe is the common (Northern) wheatear, and Oenanthe crocata is hemlock water dropwort; Prunella vulgaris is self-heal, Prunella modularis, dunnock. There are 5,000 such ambiguous generic names! I haven't yet found out why this situation was allowed to develop but in both the examples I've given the botanical generic names were assigned by Linnaeus and the ornithological generic names by Vieillot in 1816. The practice is now discouraged. Perpetuating this mutual indifference, I have never been - not truly, truly - interested in birds, though perhaps this might change following reading Max Nicholson's "Birds and Men" 1951), an early New Naturalist that I luckily found in a charity shop a couple of weeks ago - this is a book that makes you feel curious about what's going on around you. For example, I have never knowingly seen a wheatear. 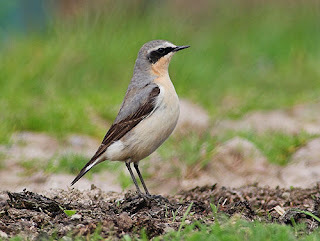 The name "wheatear" is a genteel re-styling of the country name "white arse" (a handy identification feature). I can't remember how this bit of internet surfing began, but it also took in a fascinating essay by Enid Bloch about the death of Socrates and the toxicology of hemlock, in contrast to other highly toxic umbelliferous plants such as hemlock water dropwort, cowbane, etc. Don't miss it!